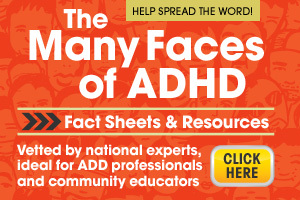 I would like for people to know that there is a whole segment of the population out there with ADHD who have amazing gifts to offer. They have stories to tell, help to give, jobs to do, people to love, lives to be lived. Without acknowledgement and acceptance of their ADHD by themselves and others, they may bury their gifts, die with their stories, never experience the feeling of putting in a week’s work they feel good about, never learn to articulate the love they truly feel for the people in their lives because they are always working on measuring up and are severely misunderstood by their “loved ones”. They frequently want their agony to end, perhaps even their lives. Can you live with that? If not, do something about it. Start a support group. Give a hug. Help a friend with ADHD. Don’t give up on us. We would not give up on you.